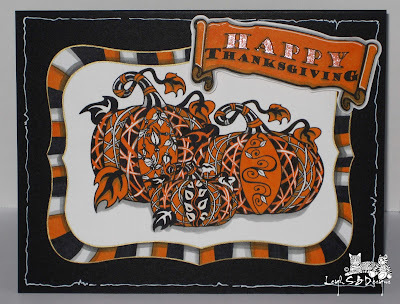 Velvet Paw Creations: "Tanglelicious Pumpkins" Thanksgiving inspiration featuring Blockheads New Digi Stamps! "Tanglelicious Pumpkins" Thanksgiving inspiration featuring Blockheads New Digi Stamps! Thanksgiving is a few short weeks away and I had fun today creating this card featuring Blockheads Paper Arts new digi stamps. I used their Pumpkin and Happy Thanksgiving images and manipulated them in Photoshop. 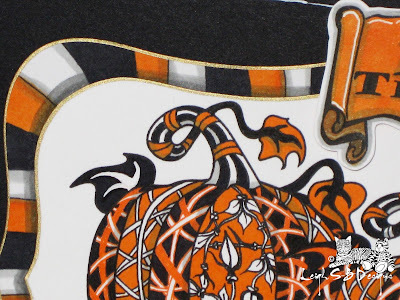 I composed a scene of 3 pumpkins and altered their shape and size and changed the size of the sentiment digi stamp and printed both images out on Neenah Solar White cardstock. TIP: Don't be intimidated by the digital stamps! You don't have to have fancy art editing software to be able to create and have fun with them. You can print out the images in the sizes they come but if you want to alter them then look for free or shareware art software downloads on the web, there's quite a few available that will allow you to manipulate the size of digi stamps! I decided to go with a black, white and orange colour scheme and used a black Micron pen and an orange Zig pen to draw the Tangle patterns on the pumpkins. 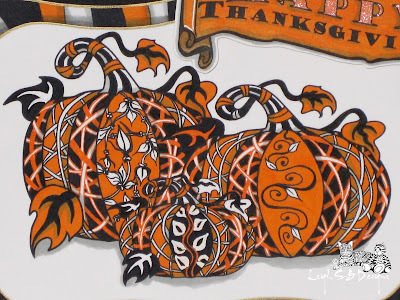 In the center segments of each pumpkin I drew organic 'living' tangles: Growth, Pendrills and Scrawlz and Hollibaugh in all the other sections and alternated the sections between black and orange. I used Black N910 and Orange O835 Marvy Le Plume Permanent markers to colour in all the areas and Ash Grey AG873 for shadows. I used a Spellbinders Label 8 die as a template to make the Pumpkin panel coz the actual die was too big for what I wanted. So I just shrunk the size down by moving the die around and tracing the shape to the size I needed and cut it out with scissors. I then die cut another panel from Neenah Solar White cardstock with the largest Labels 8 die and created the striped Tangle border with the same three Le Plume Permanent markers. Next I used the Pumpkin panel as a stencil and lightly traced the shape onto the larger panel and drew the shadow line with AG873 and AG875. I edged both panels with a metallic gold paint pen and adhered the Pumpkin panel to the striped panel with permanent adhesive tape. I adhered the panels to a black folded card blank and drew in the white free-form border with the new Marvy Le Plume Pigmented marker OP920. I then coloured in the 'Happy Thanksgiving' sentiment with O835, created shadows with AG873 and 875, added highlights with a white gel pen and coloured in 'Happy' with an orange glitter gel pen. I finished off by cutting out the sentiment and adhering it to the card with pop dots. It's a simple layout for a highly detailed image that packs a punch and I'm really pleased with how this one turned out! I've got another Thanksgiving inspired card to come that's just for the guys so stay tuned! WOW!!! Gorgeous Zentangle, Leigh!! Love the center sections with the leaves.